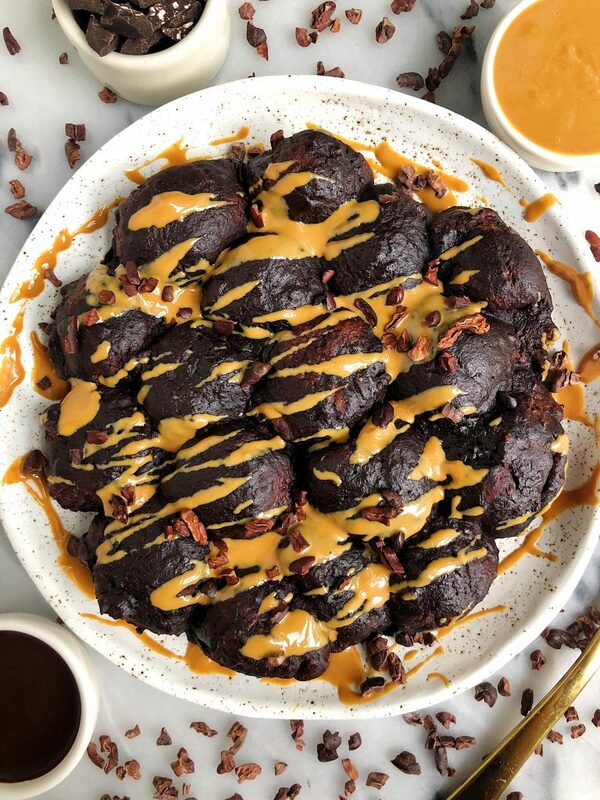 Vegan Dark Chocolate Peanut Butter Monkey Bread made with gluten-free and grain-free ingredients for an easy homemade chocolatey monkey bread recipe! I am so excited about this recipe today you guys – we are making MONKEY BREAD! I am hoping the majority of you know what monkey bread is and you are thinking back to your childhood like I am right now. If not, no worries I’m here to fill you in on the latest and give you a new homemade recipe to try at home. I first had monkey bread when I was in middle school at my friend’s house after a sleepover. Her mom said she was making us something called monkey bread for breakfast in the morning and my friend said it was a baked good. I have never been one to shy away from eating a baked good of sorts so I was down for anything. That next morning I woke up to the smell of heavenly cinnamon sugar bread coming from the kitchen. It was a fluffy circular cake with a sweet cinnamon sugar glaze of sorts on top and after one bite, I was sold. I don’t hear much about monkey bread these days and that is likely because it’s usually a gluttonous treat that most of us don’t eat on the regular. But that isn’t the case anymore. 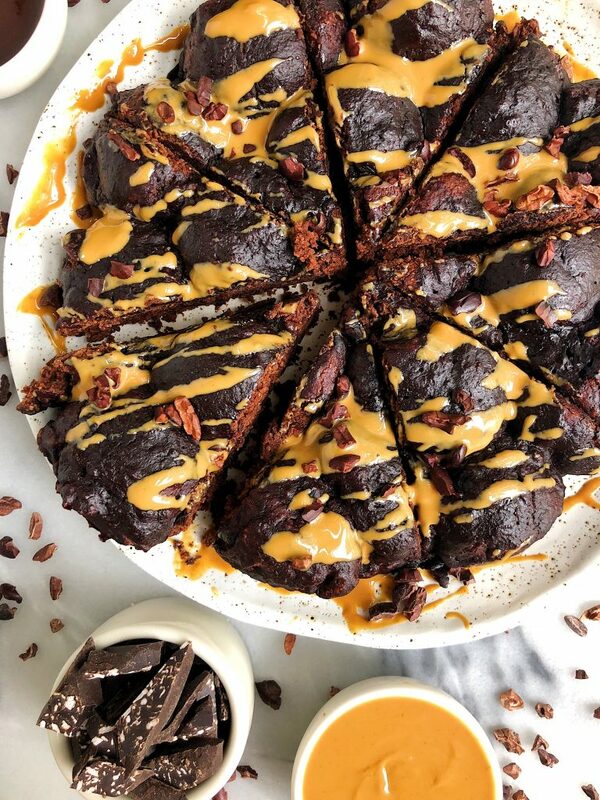 Today we are making a Vegan Dark Chocolate Peanut Butter Monkey Bread and it is gluten, grain-free and a lot easier to make than I anticipated. I didn’t even know where to begin when baking this for the first time. I knew it had to be a fluffy cake, something that you can pull apart and had a glaze of sorts on top of it before baking in the oven. I wanted to use all plant-based and grain-free ingredients, no refined sugar but I also wanted the monkey bread to taste amazing. I use a mix of dates, almond flour, tapioca flour and non-dairy milk along with a few other goods for the monkey bread part. The non-dairy milk here is so key. I use Elmhurst Unsweetened Almond Milk®, which is made with just two ingredients: filtered water and almonds. No gums, added sugar or sweeteners. Plus it adds the perfect amount of creaminess and flavor to the dough. 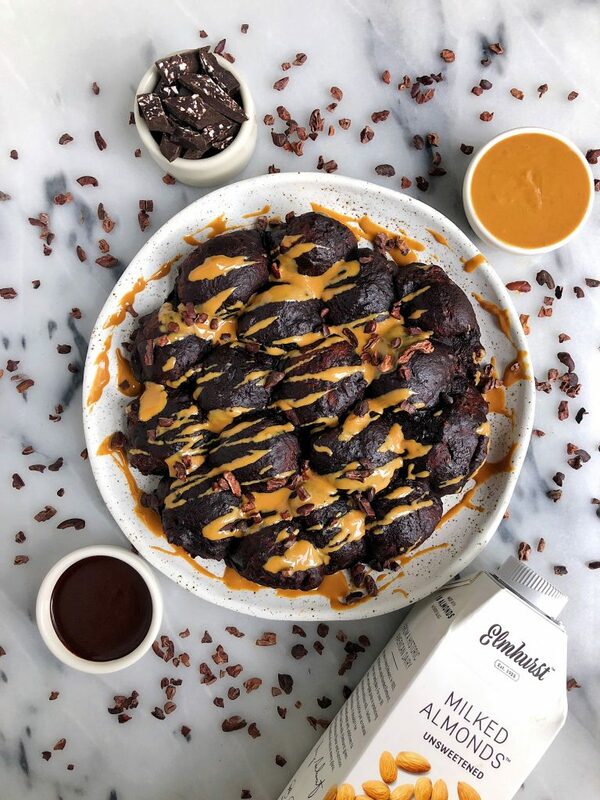 You guys read all about the new kid on the blog over in the Paleo Chocolate Chip Tahini Banana Bread, but Elmhurst has been stealing the show over here in the kitchen lately. Between Jord using it in his coffee daily to me dipping cookies in it and baking and cooking with their plant-based milks, it’s getting a ton of action. And Elmhurst just launched two more unsweetened varieties: cashew AND walnut! I am so excited to try. I love when we find a product we both enjoy and can be used for so many different purposes. Elmhurst’s plant-based milks are a staple for any baking or cooking needs. It comes in a classic-looking slim milk carton and fits nicely on in the fridge. Plus their plant-based milks are shelf stable so you can stock up and keep them in the pantry until you open them. No worries on keeping them all in the fridge! Head on over to their store locator to see where you can purchase or order online! Okay okay, so back to this Vegan Dark Chocolate Peanut Butter Monkey Bread. Make it for breakfast, brunch, snack, dessert, anything your heart desires. I cannot wait to hear what you think! Don’t forget to tag me (and Elmhurst) if you make this recipe! Pulse/blend until well combined. The dough will be thick! Bake in oven for 15-20 minutes then drizzle with peanut butter and enjoy! Store leftovers in airtight container for 5 days or in the fridge. You can also store in freezer for up to 2 months. Thank you Elmhurst for partnering for this post! It means so much to me to partner with brands I love and believe in! Can I sub tapioca with spelt flour? How would you recommend softening the dates without soaking/heating them?